Use the content below to post on your company's social media platforms, or feel free to share the posts directly from the DMP Facebook page. Follow us here! To download the photos, right click and select "Save Image As" to your computer. As we spring forward with daylight savings time, make it a habit to take care of a few things around the house. Every six months or so, double check your smoke detectors to ensure they are in mint condition, replace filters, such as hvac and refrigerator, inspect washer/dryer for clogs, etc. These low maintenance items not only help to keep your home safe, but it allows your home to operate more efficiently. Did the recent time change spark interest in home automation? Want to increase your outdoor lighting this Spring, or install indoor/outdoor cameras for added security? These days it’s simple to convert your home into a smart home. Whether you want to increase security little by little or all at once, DMP’s family of Z Wave devices and smart home technology can match your lifestyle. Plus, you have complete control and access to your home via the Virtual Keypad app. If your home has smart home capabilities, but you haven’t programmed your devices to work on a schedule, now is a great time to set that up! Using your Virtual Keypad App, create a new Favorite, then create a Schedule, and assign that Favorite to the Schedule. And just like that, you’ve automated your smart home. Can you guess what item 25% of U.S. households with broadband plan to purchase this year? It’s a video doorbell and you can order yours today! 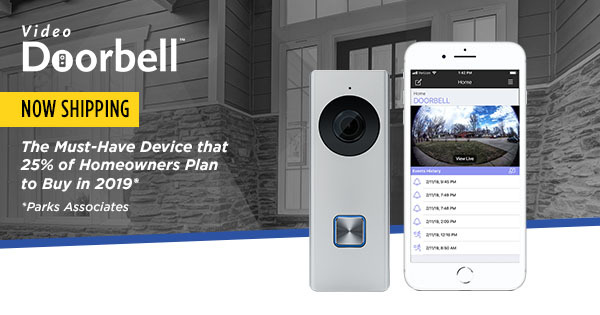 DMP’s new and highly sought after video doorbell camera began shipping March 15th! To learn more about the new DMP V-4060DB Video Doorbell, click here. Have you updated your Virtual Keypad App to 6.17? This latest version adds some really cool personalized features, such as user photos for quick recognition and a snooze option for push notifications! These new features are helpful for commercial users and home owners alike. With these frigid low temperatures, it’s never too late to prepare for inclement weather days. Have a plan in place for child care arrangements and ensure your older children have a way to enter your home in the event school is dismissed early. Automatic locks are an easy way to allow access and key fobs make it simple to arm/disarm your security system. Do you travel for work and want comfort knowing your loved ones are home safe? You can easily upgrade your home alarm system little by little to fit your lifestyle. Add cameras, glass break detectors, window/door contacts, Z-wave devices, outdoor lighting schedules, and more! Make sure to turn on push notifications within your Virtual Keypad app to receive important activity alerts. The Virtual Keypad app makes it quick and simple to have complete control over your home. Lock/unlock doors, adjust thermostats, automate lights, verify package deliveries, etc. All can be done remotely or from the comfort of your bed before going to sleep. Using your Virtual Keypad app to set your thermostats on a schedule, can keep your home comfortable and help save you money. Simply create a favorite for the desired temperature, then assign that favorite to a schedule. Wouldn’t it be nice to have the safety of pathway lighting for your home? Well, with the Virtual Keypad you can create a custom action that automatically turns on Z-Wave lighting devices when a selected motion detector is tripped. You select when the action will happen and how long the lights will remain on. Using a house/pet sitter while out of town? Your security system can be extremely helpful in monitoring activity in and around your home. Turn on push notifications to confirm door activity, view cameras to ensure the select person/people enter your home, adjust your thermostats to keep things comfortable, and modify your lights/locks schedule to accommodate your sitter. Keep your business running smoothly during the industry’s 3G to LTE transition with new LTE Cellular Communicators. These LTE models are designed for a quick 'n easy update, while offering better range and further communication. Contact your dealer today to lock in your LTE plan for 2018. As a business owner, you’re dreaming this year will be bigger than the last! So, why not start tracking that business NOW! Your security system has a built-in traffic count feature that will record data at all store front and retail locations! You can use this important data for prime sales, marketing purposes, staffing needs, and more! Stay connected with your older children after school by turning on notifications in the #VirtualKeypadApp. Did you know you can receive notification alerts to your phone when someone has entered/left your geo-fence? Plus, get notified of any door/window activity, armings and disarmings, video clips and more, all through the #VirtualKeypadApp. Use the check-in feature on the keypad to make sure your children are home and safe after school. You will receive a notification after your child presses check in and enters their unique user code. Have you heard about the new XR550 update? This firmware update gives you the ability to add up to 96 doors of access control. That's like adding six panels to your single panel! It's more cost effective to purchase and install, plus you have easier management of codes, profiles and schedules. To monitor employee traffic, generate a report from your XR panel to verify who came through the door, at what time. If your home security system is no longer in working order due to AT&T’s 2G Sunset, please contact your alarm company to take the proper steps towards an upgrade. AT&T’s 2G Sunset is in full swing! We recommend you test your alarm system to ensure it operates on a 3G+ network. Contact us with any questions. New Year’s Resolution… ARM your security system during the day! Did you know that most burglaries occur during the daytime hours when homeowners are away? So use your alarm system day and night. Keep doors and windows locked AND make sure to arm your system every time you leave home. It’s 2017 and many homeowners are interested in upgrading to a smart home. We could go on and on about the added security and convenience benefits, but smart home features also save you time and money. Your DMP alarm system is fully capable of turning your home into a smart home, so contact us today to learn how! Happy Holidays from your friends at DMP! While you’re enjoying the joy and magic this holiday season brings, it’s important to keep your family safe and your home secure. Here are some great safety tips to keep in mind while you relax and be merry! The following posts focus on DMP’s unique product features that have been developed for the commercial market. The DMP Virtual Keypad App “Area Arming” feature was developed for commercial users to easily control the arming/disarming of the security system’s multiple areas, all from a single page in the app! Download the Virtual Keypad App here: https://itunes.apple.com/us/app/virtual-keypad/id447825243?mt=8. Image: Virtual Keypad App showing commercial area arming. Do you have an office or franchise in multiple locations? Use the Virtual Keypad App to fully manage your security and access needs at each of your locations. Image: Map showing multiple locations. Are you using your security system’s built-in “Traffic Count” feature to collect important data about your business? If not, you should be! Repurpose your disarmed alarm system and you have marketing intelligence right at your fingertips. Image: Retail location with people entering doors. Do you know who is an active user for your alarm system? Keep your authorized users database up to date with the “User Code Inactivity Reporting” feature. Image: Reporting screen on iPad, phone, or computer OR crowd of people using cellphones. What’s the AT&T 2G Sunset and how does it impact you? Learn more here. Image: DMP keypad in home. Image: Person calling alarm company with keypad on wall. Image: Person learning about a new security system and keypad. Image: Woman pressing 3G touchscreen button. Image: Virtual Keypad App screen. Image: Cell tower at colorful sunset. Does the 2G Sunset have you considering an upgrade? Newer security systems have app capabilities, faster communication speeds, and built-in features that can increase security while saving you money. This can offset the expense of upgrading your system. Contact your alarm company to learn more. Image: Customer learning about new systerm features/Z-Wave equipment. Image: Bright sunset in distance. Back to School Safety Tip #1: Using the #geofencing feature in your DMP Virtual Keypad app, set up a Geofence around your child’s school. You’ll receive a cell phone alert notifying you that your child got to school safely, as well as what time he or she leaves each afternoon. Then, do the same for your house. Image: Photo of a mom in the office looking at her cell phone with the notification saying the child has entered the geofence. Back to School Safety Tip #2: A Z-Wave lock eliminates the need for a key and can be opened with a smartphone. Just give your kids their own special code, and no one has to worry about a lost key. Image: Kids getting off school bus together. Back to School Safety Tip #3: It’s important to teach your children that it's NEVER safe to answer the door while they're home alone. So, when you need to see who's at your door, cameras can add an extra layer of security for you and your child. Teach your kids how to view cameras from their smartphones. Image: Parent showing child how to view cameras on a smart phone. Back to School Safety Tip #4: Your DMP system features notifications that are sent to your app when your children come home from school. Just give each child his or her own code for added security, and you can also make sure they re-arm the system once inside. Image: Screenshot of DMP keypad. There's a way you can set up a Favorites feature to lock your doors at home at any given time? Whether it’s right after they leave in the mornings or get home in the afternoons, put your locks on a schedule. Talk about peace of mind! Image: Image: Z-wave lock on a door. Images for example use only. Feel free to use a different image or purchase the images above on www.istock.com. Also visit http://dmpalarms.smugmug.com/ and browse images that are free for you to use as a DMP dealer.